Rainbow Lorikeets are colourful parrots that are very active and entertaining as companion pets. This species is monomorphic, meaning both sexes are identical in appearance. They are approximately 30cm (11.8in) in length. The body, including the back and outside of wings, is green with a lighter green nape. The head is violet-blue with shaft streaking. The abdomen is also violet-blue. The chest is mostly red with yellow markings. The wings are orange-red underneath with a broad yellow band. They have a specially adapted 'bristle-tongue' for eating pollen and nectar. When it comes to Rainbows, every object and noise will be investigated with great delight and often turned into a game. They are born clowns as they like to be silly and exaggerate their movements. Lorikeets love to play and will often roll onto their backs to wrestle with your hands or play with a foot toy. A lorikeet may decide to hop instead of walk to get from A to B. As they are so active, Rainbows need to be provided with plenty of toys. They are particularly fond of things they can swing on, make noise with and foot toys. While they like to shred things and occasionally chew, they aren't huge on chewing compared to many other parrot species. They go to the toilet frequently and tend to 'squirt' their liquidy droppings rather than simply 'squat'. This increases the risk of faeces landing on the walls and outside the cage. Many lorikeet owners prevent this by putting plastic barriers on the wall behind the cage or clipping a sheet to the back of the cage. However, being liquid droppings does make them easy to wipe and clean up. 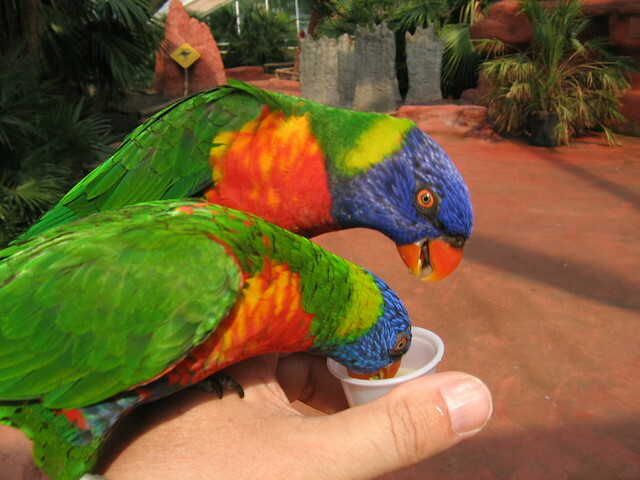 In captivity, a lorikeet's base diet should be either wet or dry nectar mix (or both). Wet is often preferred over dry, however, a high-quality dry version can be provided and the lorikeet will mix it with water itself (therefore, the water should be placed close to the dry lorikeet food). As well as the base diet, Rainbow Lorikeets should also be feed fruit and vegetables. Native Australian chemical-free flowers such as bottlebrushes are also appreciated. 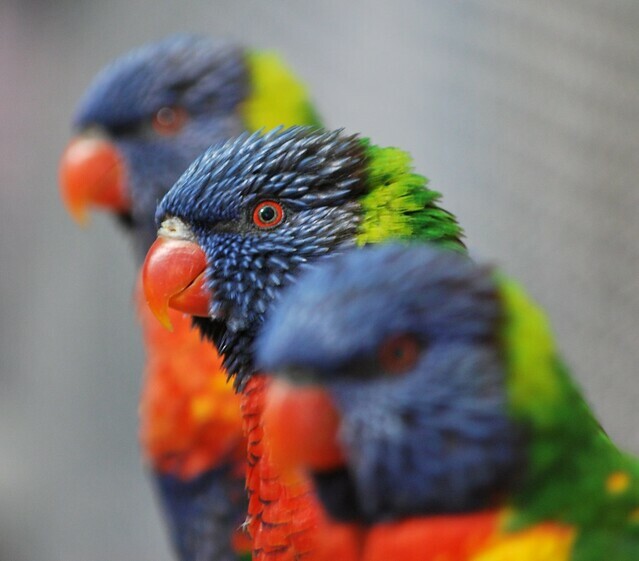 Be aware of foods high in iron as lorikeets are prone to health problems due to high levels of iron. A Rainbow Lorikeet's lifespan is around 20-30 years. There are now a number of established mutations (colours) of the Rainbow Lorikeet. A blue mutation was also found in a young wild lorikeet. Unfortunately, the individual died from injuries due to a bird of prey attack. I had always wanted a Lory but it seemed to not be in the cards. I visited the Birmingham Zoo in Alabama and went to the Lory exhibit which was very exciting. As I left one hid in my bag and tried to escape with me; little did I know I would have one join my flock. My friend had a Lory that needed to be adopted and we made the decision to have Zara join our home with our other three feathered friends. Zara is a Blue-Streaked Lory and she is now 11 years old. She is quite the pistol and very animated. When we adopted her we didn't know what we were in for. Though I should have known when I left the zoo and the little escapologist hid in my bag. She has the most beautiful colorings I have seen. She is primarily red with black dispersed in her feathers. She has two dark blue streaks from the corner of her eyes and red with sky blue tips on her neck. She doesn't have belly feathers as she plucks which is now out of habit even though, she is still very beautiful. There are two species. Lories which have short blunt tails and Lorikeets which have long tapering tails; though this usage can be subjective like parrot and parakeet. They are widely distributed within the Australian region, south-eastern Asia, Polynesian Islands, Papua New Guinea and Timor Leste. Their plumage is very eye-catching and colorful. Because they are small and extremely beautiful many people want them. Like any parrot, the owner needs to be educated to Lory's special needs, particularly their specialized diet of a nectar replacement. Their droppings are very messy as it is mostly liquid. We now have Zara a Blue-Streak Lory living amongst the flock and she is different from our other three as they are hookbills and eat a very different diet than Zara. Hookbills have the ability to open nuts and they eat the seed. It is dangerous for a Lory to eat seed as their esophagus lining is very thin and it could literally rip the esophagus lining and kill a Lory. As to the diet a Lory eats, it sounds complex but it is actually very easy as they eat nectar, juice, fruit, and vegetables. When I feed Zara I mix her nectar powder with water and the temperature should be around 100 degrees Fahrenheit and made into syrup. She also has dry nectar that is near her water. Lories have a specialized brush tipped-tongue (tufts of papillae, extremely fine hairs) which she uses to pick up her dry nectar and mix with water. Consequently, her droppings are very messy as her diet consists mostly of liquid. Zara also eats fresh fruit like cantaloupe, apples, oranges, and berries on her fruit kabob. At night I give her a bowl of mixed veggies. Get the frozen veggie bag with peas, carrots, carrots and green beans. Just take out the green beans and lima beans as they are high in iron and Lories cannot break down iron in their liver. Lories are very iron sensitive. To help break down iron in Lory's liver I give Zara milk thistle (alcohol-free!!). As a treat, I give her one grape and she loves it. When feeding a Lory, always check the iron ratio. Lories are a little time-consuming but the reward is immeasurable! Lories and Lorikeets are very playful, animated and the class clown. They are very mischievous so they do have to be in a cage when they are left alone. When I leave the house I put Zara in her cage and while we sleep. When Zara sleeps I cover her cage; it gives a sense of security like a child with a blanket. The Ultramarine Lorikeet is endangered as it is one of the 50 rarest parrots in the wild. The Blue Lorikeet is classified as vulnerable because of the introduction of European rats to the small island habitats in which they live. There have been conservation efforts in relocating these colorful clowns to locations free of predation and destruction. As I have said Lories and Lorikeets are a very special breed of parrots and require a lot of attention. Keep in mind they are like a domesticated hummingbird only in parrot form. Lories and Lorikeets are very high-strung and have a lot of energy because the nectar is mainly made up of sugars, their fruit has a lot of sugar and the juice they drink is made up of sugars. They are always on the go. Keeping this in mind they are very enticing as they are small and extremely colorful. I can leave my other three feathered friends out of their cages when I leave and they will still be sitting where I left them when I get home. Zara, on the other hand, will have roamed the house and needless to say I have to search the house for her. Zara may seem like a lot of work but she well worth it. I am very pleased she has joined our flock.